Hi all - I have a wall mounted TV that I want to use my Pi to drive. The power sockets for the TV sit behind, and there's room for a "normal depth" socket to fit without causing the TV to me pushed out at an angle - the depth of the socket when pluggin in approx 2cm. However, all the power supplies I can find for the pi - including the one I have (see picture) are much deeper - the official supply I have is approx 4cm deep, and so causing the TV not to sit flush against the wall. Does anyone know if a "slim" power supply supply is available? How about a short extension lead, so the Pi PSU can rest on top of wall bracket. 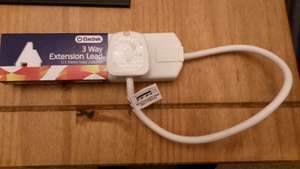 Poundland have some short 3 way extensions I have found quite useful. Cable ties to keep things neat. In the US, I can get extension cords with flat plugs that stick out about 1/4". One could get one, cut it to the desired length and install a new female plug on the end. I created one by cutting a mains PSU apart, extracting the PCB, soldering mains lead to come out one end, with 5V out the other. That was then secured in a slim plastic case. There is no slim power supply. 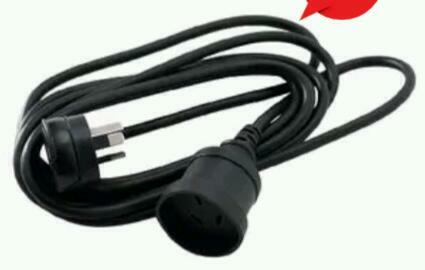 Get a slim extension lead / powerboard adaptor. It required building home-made gear with mains voltage sub-assemblies, though... so don't tackle this unless you're happy with the safety aspects of doing that. I took the case off an old Blackberry USB wall adapter. Took an extension cord, cut the socket end off, soldered the blackberry power supply directly on to the cord, placed the power supply in a small "project box" drilled with a few ventilation holes. Been working a treat for 2 years. Have placed a small temperature sensor in the project box and it's never given any concern. Everyone here who made custom jobs, has probably voided any insurance they have, and would also likely be arrested if caught, even if they are a licensed electrician. My advice; stick to store bought electronics when dealing with AC. I believe the phrase required is "citation needed". The simple version is: no appliance is allowed to be connected to a household power circuit unless it has been approved by the SAA and installed by a qualified and licensed electrician. It may well be that a mains socket needs to be installed by a licensed person, or that permanent connected devices need to connected by a licensed person, but I don't believe that it requires a licensed person to plug something into the socket. I meant the engineering of said item. It depends what you define as an "appliance". For example, connecting an electric hob or fan oven to a 30A supply is somthing that's best left for a competent person. That's true here in the UK if what you're doing is covered by part P.
I have a friend who found a 30A cable buried in the wall of his kitchen (they cooked on gas). It was a wonder he didn't die when he cut that one with a pair of pliers only to discover it was still live. The electricity board were quite shocked (excuse the pun) when they were called to come and make things safe before replacing the 100A company fuse. There's nothing to stop me building electronics/electrical equipment designed to be connected to a 13A square pin plug. There isn't even a requirement for portable appliance testing of things for my domestic use (although my eldest can do that for me if required since he's a sparky). From a quick Googling on what can be done in Australia; the rules do seem to be far more proscriptive than in the UK and elsewhere. Just replacing a light switch or bulb socket, building your own extension lead, even fitting a plug, appears to be illegal and requires the work to be undertaken by a qualified electrician.